ANOTHER VICTORY ONLY EXCLUSIVE ITEM! 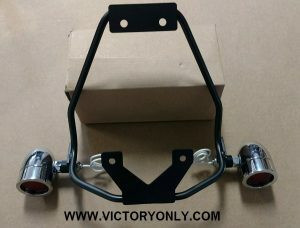 REMOVE THE STOCK HUGE PLASTIC LICENSE PLATE AND TURN SIGNAL MOUNTS AND INSTALL OUR LOW PROFILE MOUNT. 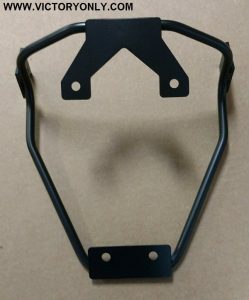 SIMPLY UNBOLT THE FACTORY PLASTIC AND INSTALL OUR BRACKET IN THE SAME HOLES. ALLOWS THE REAR TIRE TO BEE SEEN FROM BEHIND FOR THAT CUSTOM LOOK WE ALL WANT. 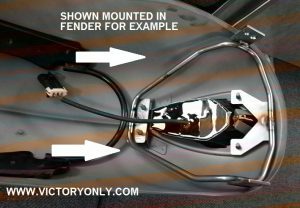 PICTURE BELOW SHOWS A VICTORY MOTORCYCLE VEGAS REAR FENDER FLIPPED UPSIDE DOWN WITH THE BULLET LIGHT MOUNT BRACKET KIT INSTALLED. LED LIGHTS OR BULLET LIGHTS ARE SOLD SEPARATELY SO YOU CAN CHOOSE YOUR FAVORITE STYLE LIGHTS.